Android is popular, of that there is no doubt; but then being “free” and thereby making the enprice to the consumer a little more palatable doesn’t hurt it either. Nowhere more apparent is this popularity that the Android Market and the number of apps downloaded every month. While Apple might still be in the lead with some 18 billion apps having been downloaded by the end of October of this year Android has very quickly been gaining on the competition. As of October Android exceed the 10 billion download marker and is reported to be experiencing 1 billion downloads per month now. 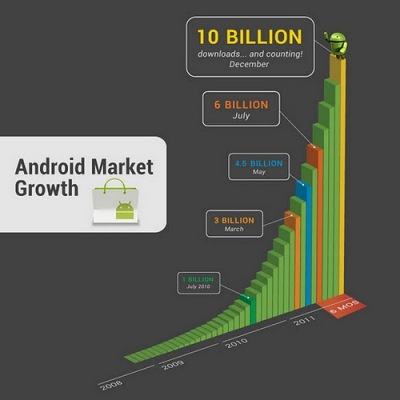 And you should expect the Android Market download figure to shoot up exponentially — and soon. App downloads are already rising at an accelerating pace, and there will likely be a flurry of post-holiday download activity as gift recipients fire up their brand new Android-powered tablets and mobile devices, and load them up with apps.